—Ach, Gott! mein lieber Gott! This boon of which I sing? Three noble senses drowned in bliss! Is there beside compares with this? I guess I do make a lot of tart shells. This week alone, I’ve baked nine batches, a grand total of 204 shells. Don’t laugh, there were extenuating circumstances. And I only kept one set for myself. We’re still eating them — three of the dozen were filled with cheese and glazed onions. The rest have been slowly but surely spread with raspberry jam and eaten for elevenses (I can’t seem to get through a morning at work without a cuppa and a nibble) or for dessert. Here’s tonight’s ration. I took mine with a mango black tea latte. He had his with a mug of China green tips. After these, there are just two more. I can’t tell you how thrilled I was when someone asked for my tart shell receipt yesterday. So here it is, in all it’s glaring modernity. Makes 24 mini shells, or 12 standard-cupcake size shells. Bring butter and cream cheese to room temperature — they will be very soft. Blend butter and cream cheese with a fork or a mixer. Whip a few seconds, until very smooth. Sift in the flour and mix with a fork or pastry blender. Form a ball of dough as soon as you can, adding a little flour if needed. The less you work the dough, the more tender the result! Wrap the ball of dough in a plastic bag and let it rest in the refrigerator for at least an hour, or up to 24. Cut in half, and in half again. If you’re making mini shells, cut each piece once more in half, for a total of 8. Pull each of the four, or eight, pieces of dough into three parts. Put the little balls of dough into an ungreased muffin tin. Using your finger, spread the dough to cover the bottom and sides of each muffin. You may need to let the dough warm up a little to make it easier to spread. Prick the bottom of each shell with a fork. Bake at about 400 degrees for 10-15 minutes, or until the edges are golden brown. This is a totally modern recipe. I found it on the internet a few years ago, shortly after I began catering tea parties. It is fail-safe, quick, and easy. Also, it produces a tender, rich, flaky crust. Butter alone is harder to manage, and always seems a little tough. My Gram, whose pie crusts are legendary for their blue-blooded delicacy, taught me to use Crisco. But after the whole hydrogenation scandal, I’ve tried to avoid it. How did they manage in the 19th century, you ask? Surely they didn’t just endure tough “paste” (Victorian for pie crust) until the advent of Crisco? They used lard. Which I’ve never tried because it too is now hydrogenated, at least the kind they sell in my local market. 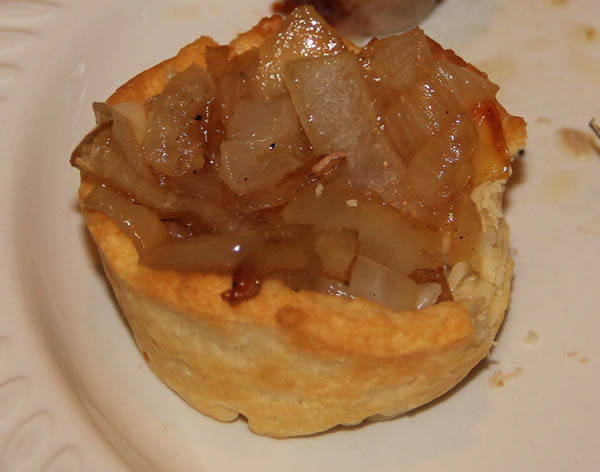 Last night, I made onion tarts, inspired by a 1911 recipe from Rufus Estes’s Good Things to Eat. 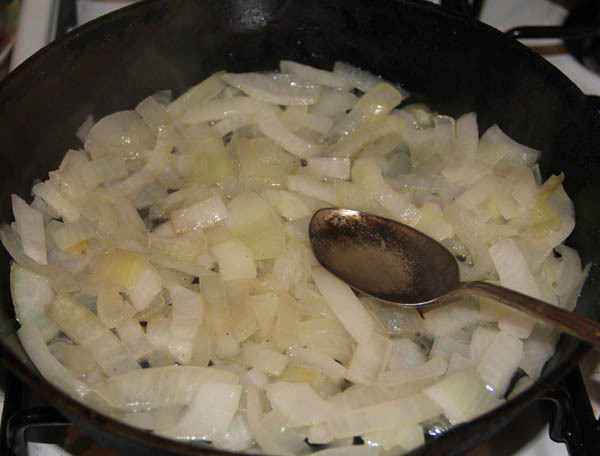 GLAZED ONIONS –Peel the onions and place in a saucepan with a little warmed butter, add sugar and salt to taste, pour over a little stock. 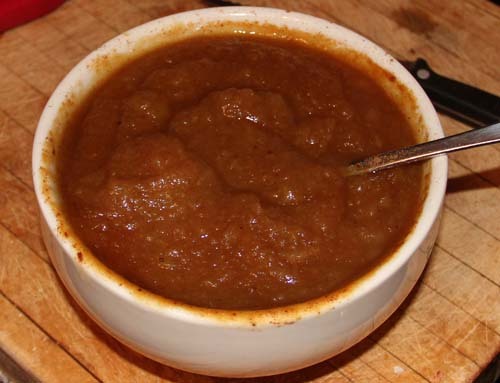 Place over a moderate fire and cook slowly till quite tender and the outside brown. Remove and serve on a dish. A little of the liquor, thickened with flour, may be served as a sauce. 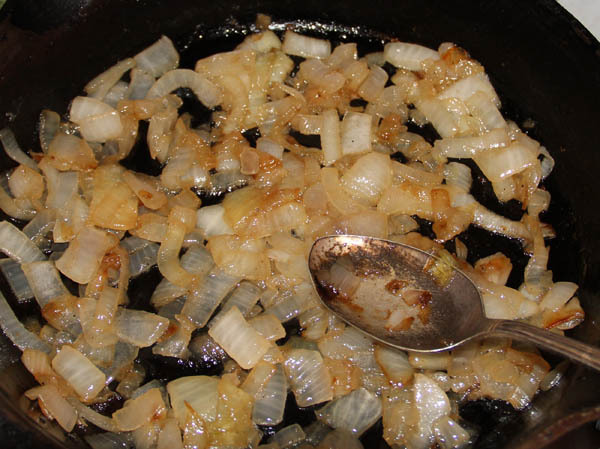 I chopped up a giant sweet vidalia onion, and tossed it into an heirloom cast-iron skillet, along with a chunk of melted butter, a couple teaspoons of sugar, and a dash of salt. I didn’t have any stock, so I just covered them with a little water. Cooking over a “moderate” flame, it took a surprisingly long time for the onions to begin browning. But oh, when they did, what fragrance wafted through our garret! There wasn’t any liquor left over to make into sauce however. Perhaps I didn’t put in enough water/stock? But the onions themselves were definitely coated in a beautiful, sweet glaze. 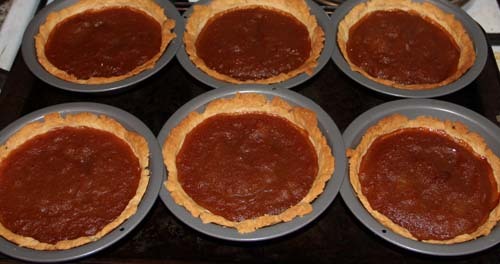 I made a batch of tart shells to hold the onion filling (and a few extra for raspberry jam tarts) from a modern recipe. 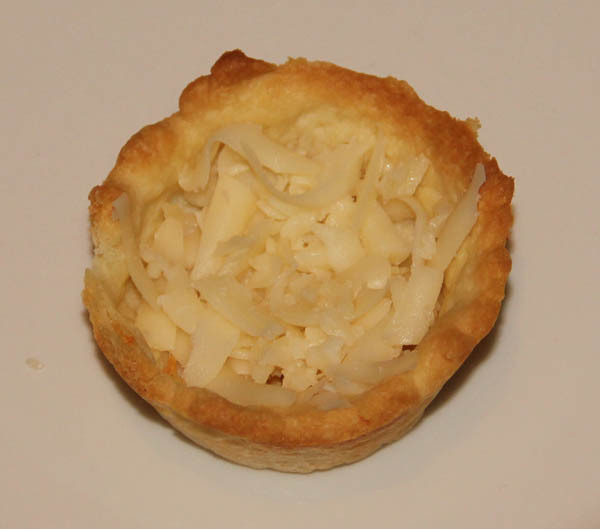 At the last minute, I tossed some grated Emmentaler into the bottom of the shell. The hot onions melted the cheese. I forgot to take a picture of the finished tart until I’d already taken a bite. They were delicious. And the various bits kept well overnight too — I assembled another tart this evening and heated it in the oven for a few minutes. I’m in love. I began by peeling, coring, and slicing 5 or 6 McIntosh apples, plus 1 Granny Smith for flavor. I then proceeded to stew them in a bit of water plus 1 Tablespoon cognac. When they were nice and soft (only about 10 minutes as my stove was too hot), I put them through a sieve. 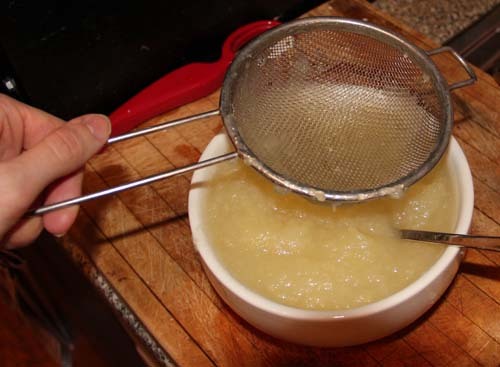 For all practical purposes, it’s applesauce. Then I added a squeeze of lemon juice — I’d intended to put in the grated lemon rind but got lazy. I spiced it well with liberal amounts of cinnamon and nutmeg (being out of all my other baking spices and desperately in need of a trip to Chelsea Market) and sweetened it with a few teaspoonfuls of blackstrap molasses. Miss Beecher recommends using a light crust, so I chose my favorite modern tart crust. Bring butter and cream cheese nearly to room temperature. Cream together until light and fluffy. Stir in flour. Form into ball and refrigerate for 1 hour. Divide into 6 pieces for large sized individual tarts, 12 pieces for muffin-tin sized tarts, or 24 pieces for mini-muffin sized tarts. 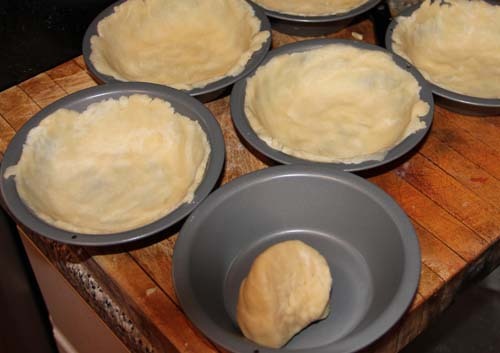 Spread dough into bottom of tart pans with your fingers. Fill and bake, or for cold fillings, pierce the bottom of each tart with a fork and bake blind for 20 minutes at 350 degrees. I used a set of 6 tart pans that I’ve been meaning to send back to my dear friend (and chef/confectioner extraordinaire) Marla for some time. She sent them filled with 6 of the most delicious homemade-from-scratch pies all the way from California last fall. Using the tins one more time made me feel as though Marla might just drop in for tea and tarts — and I do wish she could! I was nervous that the wetness of the filling might prevent the tart dough from crisping properly, but my fears were unfounded. 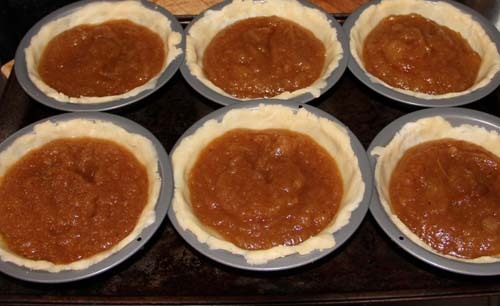 The applesauce cooked down a bit as the tarts baked, taking on a delightful, almost apple-butter-like texture. And the crust was firm, flaky, and nicely browned after 20-25 minutes. They were delicious. The man I cook for enjoyed his portion very much, though expressed a wish for whipped cream, in which I heartily concur. I’ll probably make some to accompany the remaining tarts. Or we can do like Jack Kerouac and simply empty the cream pitcher over them (a story my almost-beatnik husband — they still know him by sight at Caffe Trieste– is fond of relating whenever I serve him pie).